Richmount School was a two-room school. The young children were taught by Miss Walker, the older ones by the headmaster, Mr. William Harrison. 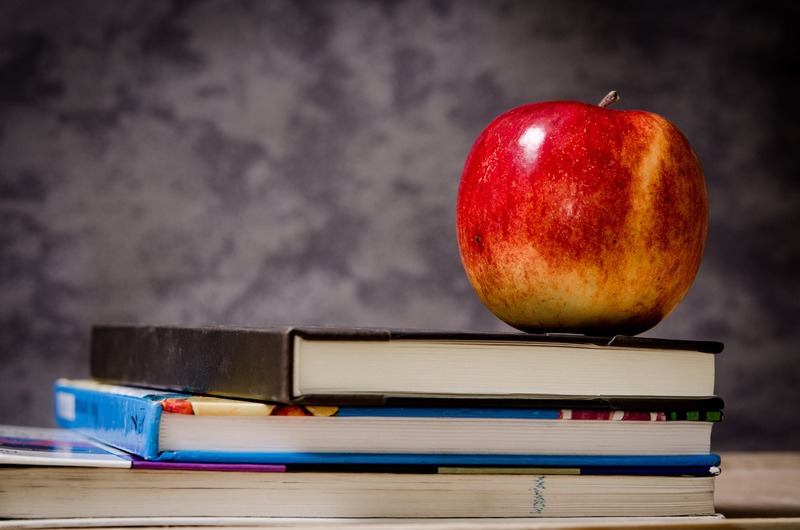 Because I was born in April, I started school when I was six years and five months old, and Miss Walker gave me every opportunity to catch up to those that had begun school the previous year. Miss Walker was an older lady, an “old spinster”, who lived with her mother next door. She kept her long grey hair in a bun at the back. Having no kids of her own, all you had to do was give her half a reason, and she quickly adopted you, and praised all your successes. When you made a mistake, she faked a look of disappointment. I remember all the things she taught us. Addition, subtraction, multiplication and division tables, her coloured chalk squeaking on the blackboard, the crayons, the paints, the Plasticine, the coloured paper and paste, and the abacus to teach counting. She taught all of us, even the boys, to knit, to darn our socks, to hold wool between our hands as someone else would make a ball out of it. Miss Walker was a big hit with our parents. 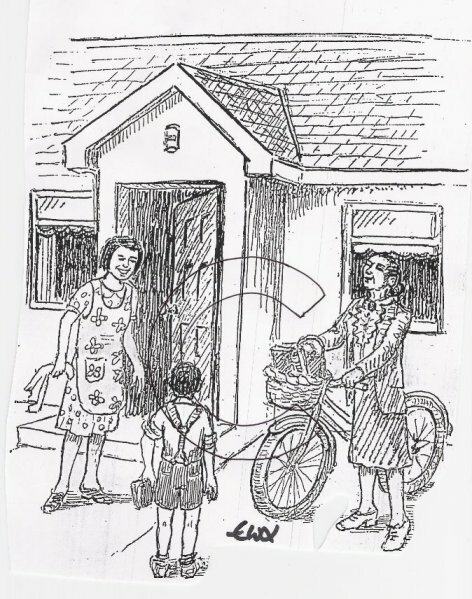 After school, she would ride around the countryside on her bicycle, with a wicker basket attached to the front, and talk to our parents. That’s how the parent-teacher-association operated in those days. I remember one time she came to see mine. I eavesdropped behind the door and heard her tell my mother that she thought I should “go far”, “could do well for himself”, that I should sit the “11+”. This was an exam at age 11 that was used to separate children into grammar, technical and secondary curriculums. When Miss Walker inquired where I was, and I was forced to make an appearance, it was a little embarrassing and I must have blushed, but inside I felt real good that here were two women who really cared about me. Then off she rode on her bicycle, up the lane, and over the hill. At age nine, I moved into the headmaster’s class. Things were different. He was a disciplinarian, and had a cane to prove it. “Hold out your hand” was his famous phrase that sent shivers down my young spinal column. There were no more knitting or darning sessions. Teaching and learning took on a more serious tone. In the headmaster’s classroom there was a big pot-belly stove. In the wintertime he would get it glowing cherry-red, and we loved to get around it. By morning break the ice in our milk bottles had thawed and we could really enjoy the thick layer of cream on the top. Then it was back to our cold desks, and on with our studies. The children at the country school were mostly from the farming community. The headmaster’s son attended, and so did the son and daughter of the local clergyman. The variety of their backgrounds intrigued me. I noticed how each dressed and spoke. How could people who lived only two miles apart talk so differently? I remember the travelling doctor visiting our school, sticking wooden things down your throat when he wasn’t sticking you with needles. Then there was the travelling dentist. He would “set up shop” in the corner of the headmaster’s large room. He would do his level best to distract you, as he crudely extracted your tooth. I would ask to take my tooth home, and he would wrap it in cotton wool for me. I would look at it often on the way home. No longer would it cause me so much pain. Eventually, the tooth fairy would pay me handsomely for it. He had a foot-pedalled, slow-speed drill that he used to drill your teeth before filling them. No water turbine drill in those days. Such was my painful introduction to dentistry and novocaine. There was some fun during breaks and lunch time. In the autumn, we would play “conkers.” That’s chestnuts that you would put a hole in, and suspend from your hand with a string. You would swing at your opponent’s with yours, taking turns, until one of the chestnuts cracked and fell off the string. Just like prize-fighters, sooner or later the champion in your pocket took its turn to crack up and hit the dust. In the spring we would play marbles. To a young boy, glass marbles with coloured swirls are a thing of great beauty and value. Marbles are also a good introduction to business profit and loss, with the financial statement rattling (or not) in your trouser pocket. In the wintertime, if we arrived at school early, we would have fun sliding on the ice in front of the school. The road would be like a sheet of glass, and we would run up and slide. The more use the ice got, the more slippery it became. It never dawned on us why our shoes didn’t last a whole school year. Across the road from the school, lived the Love family. They were older people and were rumoured to keep magpies as pets. These birds had a bad reputation of stealing things. When a ball went over the hedge onto their property, there were few volunteers offering to retrieve it. On our way home from school, my younger brother and I would fish the local stream for sticklebacks, “sprickleys” we called them. Lying on our bellies we had everything in the stream, jam jars with stings attached, and nets made out of our mother’s old nylons. We would catch them by dangling wriggling worms in the water and getting them to swim into our traps, which we would then pull quickly out of the water. Usually the fish were quicker than we were. We were especially interested in catching the “red-throat.” We thought it was a special breed, but it was only a male sprickley trying to find a wife. If we were lucky to catch one, it was brought to school next day for display. Our concentration on fishing was only broken by the sound of the train whistle. Fishing was over. We grabbed our school bags and raced for the railway bridge, just in time to watch the steam locomotive go huffing and puffing down the track. All too soon we saw the caboose, and we knew that it was time to head homewards. There was one more stop we would make. We had to stop in at “Granny’s.” There was always some milk and cookies there for us. Maybe our Grandad was home. Maybe we could see their donkey, or their baby ducks, or goslings. Or, maybe they were too busy churning and making butter. After leaving “Granny’s,” we passed their apple orchard. Coming into summer, we monitored the progress of the apples intently. Long before they were ripe, we had begun our sampling, and our stomachs usually reacted violently to this early testing program. By the time they would have been really good for eating, our favorite apples were long gone, and our Grandad gave us a good “talking-to.” He knew. He had been young once himself, a long time ago. Eventually, we would arrive home and get a scolding. “Where were you?” my mother would ask. “I was worried about you.” We told her the “latest” at school, and at Granny’s and everything was forgiven. Walking home with my older sister, Sadie, took on different interests. We would pick wild flowers, such as primroses, violets, foxgloves, honeysuckle, dog-roses, etc. Primroses were especially pretty and fragrant. I remember us bringing fistfuls home to our mother, and she would fill two jam jars with water to contain my sister’s and mine. My mother would then “admire” them greatly on the kitchen table, and at the appearance of the first bug, she quickly declared an emergency and put both of them outside. “They are full of bugs,” she said. “You can still see them outside on the windowsill.” Between us, and our cat, which brought mice to the doorstep daily, our mother was kept busy. Eventually the time came for Miss Walker to announce her retirement. The parents went berserk, including our own. No way could she be allowed to do this. On the appointed day, parents and children showed up at school with banners and posters, to demonstrate. Such outpouring of love for a teacher was a sight and feeling to behold. The local reporters were on the scene. Miss Walker relented. She stayed on a little longer, just long enough for everyone to get used to the idea that everyone, including her, deserves their retirement. I was scheduled to sit the” 11+” exams. On exam day, my father brought me to the Hart Memorial for the first exam, and we were running late. Punctuality was not one of my father’s fortes, often miscalculating distance, speed, time and possible hold-ups along the way. I was rushed to my seat and I immediately went to work “Strawberry is to Red as Grass is to _____.” I quickly pencilled in “Green” and rushed on to the next question. I passed the exams. I was on my way to grammar school. But that’s another story.